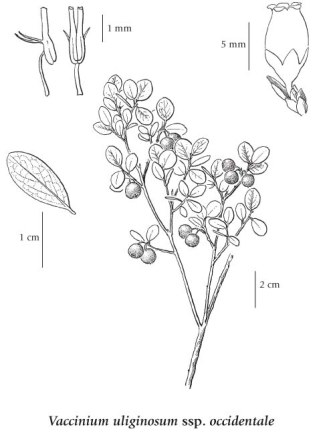 Low, spreading shrub; stems 10-30 cm tall, not angled; young branches yellowish-green, minutely hairy; old branches greyish-red. Alternate, deciduous, from broadly egg-shaped to oval or elliptic, 0.4-3 cm long, 0.2-1.5 cm wide, rounded at tips, tapered at base, glabrous or minutely hairy, green above, lower surfaces pale or with slight bloom, strongly net-veined, margins entire, rolled under somewhat. 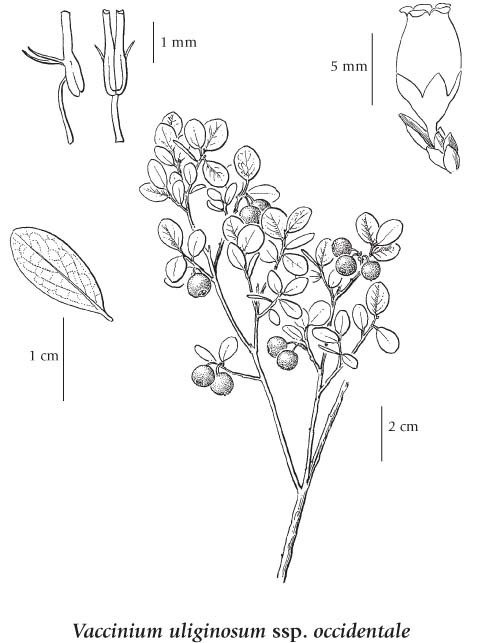 Clusters of 1-4, in leaf axils; corollas pink, egg- to urn-shaped, 5-6 mm long, 4- to 5-lobed, the lobes curled back; calyces deeply 4- to 5-lobed, persistent on mature fruit; filaments glabrous; anthers awned, the pore-bearing terminal tubes about equaling the pollen sacs. Berries, globe-shaped, 5-8 mm wide, blue, with a bloom; edible and sweet. 1. Leaves glabrous or minutely hairy........................ ssp. occidentale (A. Gray) Hult. Bogs, dry to wet rocky tundra, meadows, thickets and boggy forests in the lowland to alpine zones; frequent in coastal BC (ssp. occidentale), and in N BC (ssp. pubescens); circumboreal, N to AK, YT, and NT, E to NF and S to N MI, NY, and N CA; Eurasia. A shade-intolerant, submontane to alpine, circumpolar deciduous shrub (transcontinental in North America). Occurs on very moist to wet, nitrogen-poor soils within tundra, boreal, cool temperate, and cool mesothermal climates.